Every week I write a political issue that affects YOU and the World AROUND YOU. On Monday April 21st 2014, I attended the 118th Annual Boston Marathon event. Not only was this my first Marathon, but my first experience in witnessing history: seeing Meb Keflezighi “take back the finish line” as the first American to do so in over 31 years. Noting what the Boston Red Sox had done in the World Series championship last year (2013), he added that he wanted to provide a similar boost: “When the Red Sox did it, I said, ‘I want to do it for Boston. '” –Meb Keflezighi. And what was truly inspiring was the fact that he wrote the names of the Boston Bombing victims (Krystal Shakespeare, Martin Richard, Ling Zi and Sean Collier) on his racing Bib–and how he honored them in his race. “They helped me carry through. At the end, I just kept thinking ‘Boston Strong’. 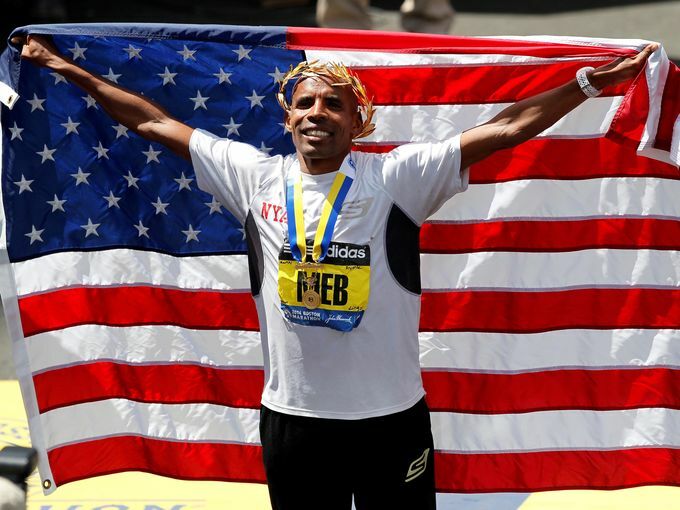 I gave everything I had for Boston,” said Meb Keflezighi. His victory did not only bring a lot of joy but controversy–about what it means to be an American. A theme that has brought back this controversial article from the grave. So why does this affect you? It affects you because it is a reoccurring divisive theme in American politics–from Immigration to Race. It is this type of reoccurring theme that has led Real Estate Mogul Donald Trump and others on a wild goose chase to obtain a birth certificate from the President of The United States; because his name sounded foreign. To the unfortunate remarks that were written against Meb Keflezighi in 2009. If we don’t tackle this problem as a collective nation, our nation will continue to divide into smaller nations, and politicians will continue to abuse their power by not serving the best interests for All Americans (Americans like Meb Keflezighi). I, for one, am glad that Meb won the marathon that day, because he has allowed us to rethink of “What It Takes To Be An American.” An American, who out of thousands of runners, wrote the names of the Boston Marathon Bombing victims on his bib. And an American, who dedicated his whole run and win on behalf of those victims. THAT IS AN AMERICAN! To those who continue to chastise his ethnic background, his path towards citizenship, or his name is UN-AMERICAN! Especially after what he accomplished in a 26.2 mile run. Disclaimer: THIS IS MY OWN POLITICAL OPINION. IF YOU HAVE QUESTIONS OR COMMENTS PLEASE DIRECT THEM TO MY CONTACT PAGE.